The stock car organization is looking to diversify its brand which for gamers could lead to very good things. 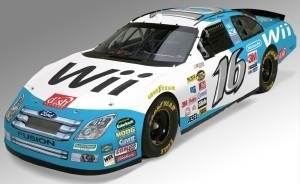 With sales of EA's annual NASCAR title posting less than desirable results and Nintendo's Wii offering up a whole new world of potential (as demonstrated by the recently released NASCAR Kart Racing), the fledging organization may look beyond the pastures of its current exclusive agreement, having been attached to EA since 1997. "We're in the process of figuring out what's the best model for us and how do we position ourselves in this space," said Blake Davidson, NASCAR's managing director of licensed products in an interview with SportingNews. "Do we continue with an exclusive model or go nonexclusive? Do we need annual releases? This is a very important category for us." While the organization is currently in discussion with EA about the possibility of renewing its exclusive agreement, it takes its gaming business very seriously, being one of the top five sources of revenue for the company. And with plans for a NASCAR '10 title currently on hold, it's considering the idea of multiple game developers working on different games based upon the sport. For your average gamer, the idea of even more NASCAR titles on the shelves every year isn't the most exciting proposition (it tends to be a sport where, unless you're deeply entrenched in its culture, you're not just going to jump in), consider this: were NASCAR to forgo an exclusive agreement with EA, it may just lead to Sega optioning the rights to bring Daytona USA and its awesome soundtrack back to a console near you. Heck, we could even get a decent port of Daytona USA 2: Power Edition, and then I'd own a game truly worthy of being buried with.